Enlighted specializes in making high-quality custom lighted clothing, costumes, and accessories with stunning visual effects. We're inspired by a constantly evolving blend of art and technology, and we strive to create exciting memorable garments that will reveal your inner rockstar in a fun and fashionable way. physical address: Please call or email first if you are sending clothes to be illuminated, or if you need directions to our studio - we are open by appointment only. Join our announcement list if you'd like to be notified of new products, events, and major changes to our website. We won't share your email address with anyone else, and you're welcome to unsubscribe at any time. 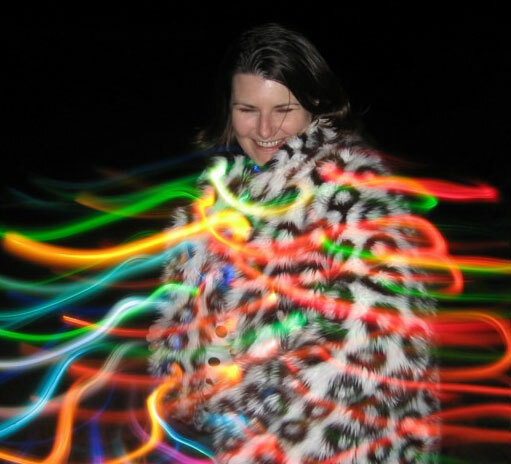 Janet Cooke Hansen is the founder and Chief Fashion Engineer of Enlighted Designs, where she has been creating custom illuminated clothing for nearly twenty years. She is well known as a pioneer and innovator in the field of wearable technology, and has created thousands of unique garments for a variety of international clients. This "dream job" combines her lifelong interests of fashion, art, and technology, as well as her formal training in engineering. Janet attended Harvey Mudd College in Claremont, CA, where she received a B.S. in General Engineering, graduating with High Distinction and Honors in Engineering. She also minored in art, and party-planned for several years as the chair of the college social committee. Janet did her graduate studies at UC San Diego, where she earned M.S. and Ph.D. degrees in Applied Mechanics and Engineering Science/Bioengineering. She spent four years working in the aerospace industry (as an actual rocket scientist), but found herself to be better suited to her current role, combining art and technology in a mostly-undefined workspace. She also paints, and has another website for her fine art portfolio: janethansen.com. Enlighted creates custom lighted stage clothing for professional entertainers in the music industry, as well as for applications in art, theater, dance, theme parks, athletic events, television, film, and advertising. We develop custom electronics to produce a variety of lighting effects in garments and textile-based accessories. Enlighted is based in Encinitas, California, in the northern coastal area of San Diego county. Janet founded the company in 1998, and operated as "Eclectic Electric" prior to incorporating with the current name, Enlighted Designs, Inc., in early 2000. The name Enlighted was inspired by our dream to have a world free of ignorance, prejudice, superstition, and fear, and we are strongly opposed to discrimination against other human beings on the basis of differing religion, ethnicity, national origin, or sexual orientation and identity. The yin-yang logo symbolizes the merging of opposing forces into a balanced whole. We strive towards this type of balance with our designs, which combine a variety of "opposites": fun and function, art and technology, fashion and engineering, and so on. We've replaced the traditional dots with rectangles that are suggestive of an electrical outlet (in the US, where we are based). This also makes it look more like the letter e, for enlighted. For limited edition ready-made items, please use our online store. For custom projects, we will gather information about your requirements, and propose a design plan via phone and/or email (or with an in-person meeting, in some cases). Please see the custom orders section of this site to learn more about that process. How do I find your prices? Our online store has a limited selection of ready-made items, when available. Anything else would be made as a custom order, with a minimum cost of $500 for most garments. The cost of a custom project can vary over a wide range, depending on the number of LEDs, the method for mounting the electronics, the complexity of the lighting effects (steady glow? animated patterns? color changes? ), and the type of control needed (manual switches? sound reactivity? wireless DMX?). Designs with hundreds of lights are typically in the range of thousands of dollars. Delivery time will depend on the complexity of the design, the number of garments involved, and the workload that we are already committed to at the time. When we are especially busy, we might have a waiting list of several months before we are able to accept new clients. Our standard turnaround time for a custom project is usually 4-6 weeks. Large orders could require several months of production time. Rush orders as fast as 1-2 weeks (or less) are sometimes possible. If you need your clothes to be Enlighted by a certain date, please include that information when you make your inquiry. We will commit to a delivery date when an order is confirmed. Can you add lights to my favorite jacket/dress/hat/etc...? In most cases, the answer will be yes. This approach is strongly recommended for items that require a good fit, so that you can verify that the size is correct before the lights are added. We can install lights in almost any existing garment or accessory, new or used (as long as it's clean, please, and preferably NOT treated with fabric softener or anything else that would introduce strong odors to our workroom). If you email a picture of the garment to us, with a description of the lighting effect you'd like, we can often help to make some suggestions. What kinds of fabrics and garments can you work with? In general, it will look better if the lights are mounted in a fabric that can provide a reasonable amount of support. The electronic components that we use are not very heavy, but they can cause sagging or uneven hanging if the underlying fabric is too thin or stretchy. It can also be difficult to work with stretch fabrics, because the electronics will need to be installed in a way that can accommodate the stretching, but without adding too much bulk. Tight, form-fitting pieces of clothing are challenging because they undergo a high degree of bending and stretching when they move with the body. Complex designs on tight clothing can require multiple fittings and adjustments, both before and after the lights are installed. Depending on the type of lighting that you require, it might be necessary to build reinforced non-stretch regions in the places where lights are mounted. Or, the lights could be mounted in separate accessories that are worn over (or under) another piece of clothing. Can you make a replica of something in the gallery? Or something similar? It depends. We can usually make a new lighted garment that is similar to something shown on our gallery pages. However, in some cases the base garment may have been a one-of-a-kind item supplied by the client, or we may have an agreement to make a specific design exclusively for one client. We prefer to use our archives of previous projects as examples of what is possible, and as general starting points for new designs. We can achieve the same overall light density or dramatic effect, but the precise placement of lights might be adjusted for a different size or style of garment, for example. Other details might be altered to incorporate new technologies, new materials, and new ideas (we have plenty of those!). Can you make something similar to a costume from a movie, or from someone else's performance? It depends. We can use other lighted costumes as a source of inspiration for an original design, but the process will incorporate our artistic vision and construction techniques. We do not make "exact replicas" of other people's work, out of respect for their copyrights and as a matter of artistic integrity in general. We really do prefer making something completely new for each of our custom clients, and improving upon what has already been done. Can you make something original, beyond what's shown on the site? Yes - we are not limited to the pieces shown here, and we enjoy creating variations on these themes as well as completely new designs. Please send whatever description you have, including sketches or pictures of your ideas (or the base garments), and any information on budget, schedule, and other special features that might be needed. We'll be happy to make suggestions. What kinds of batteries do you use, and how long do they last? It depends on the space available in the garment, the number of lights, the brightness, and the length of time that the lights will be used between battery changes or recharging. Most garments are designed to run for at least one full evening of use, but we can adjust the battery size, brightness, and other factors to meet the needs of a specific project. Most of our lighted garments require DC power in the range of 6 to 12 volts. Designs with a small number of LEDs can often be powered by a standard 9V battery. Some projects are powered by rechargeable battery packs, and others use standard AAA or AA cells. Where do you hide the batteries? Again, it depends on the garment and the type of batteries. We try to select the smallest batteries that will provide a reasonable lifetime, or that will meet whatever requirements that you specify. In a bra, the battery can be held under the arm or within the bra cup. In a jacket, batteries are typically stored in a pocket. In pants, the batteries may be held near each ankle, in a pocket, or in a box with a belt clip. How do you wash light-up clothes? Many of our LED-based designs with permanently installed lights can be hand washed in water (with the batteries removed) with a mild detergent and then dried flat. They can also be spot cleaned, or treated with a fabric-freshening product such as Febreze. We don't recommend machine washing, or machine drying, or dry cleaning, because of the risk of high stresses (due to spinning and bulk processing), extreme temperatures, and harsh chemicals that may be involved. If you need a light-up garment that is machine washable, we can also provide lighting designs in which the electronics are fully removable. Can you send me a printed catalog or brochure? No, we don't have a printed catalog - our online version is better for demonstrating animated blinking and fading lights. Yes! Our electronics are lightweight, flexible, and concealed within fabric linings, creating the most comfortable lighted garment possible. Seriously - you'd forget about the lights if you didn't have so many people staring at you! Are light-up clothes safe to wear? Yes! LEDs operate on low voltage circuits, and are extremely safe to the wearer, even if you get them wet (although moisture may interfere with an active circuit - see washing directions above). As is the case with most consumer electronics, the most dangerous part is the battery. We recommend that you take common-sense precautions, such as not storing keys or coins near exposed battery contacts. Can you tell me where to get all the parts, and how to make this myself? While we admire and encourage the DIY community, we are not in the electrical tutorial business. Our methods are based on extensive experience (25+ years of electronics, 35+ years of sewing, 20+ years of the two combined), and require a long list of specialized skills and tools. The performance and durability of the finished product will be highly dependent on the quality of work performed during garment assembly. Trust us, it's much more difficult than it looks, and most of our techniques can't be explained in a quick email or phone call. Due to the impractical level of technical support that would be required, we do NOT sell unassembled parts for people to solder together themselves. We're unable to provide free personalized help, but for people who already have some basic skills in electronics and/or sewing we have posted some award-winning tutorials on the site Instructables.com, for both LED and EL-based designs. Please look there if you want suggestions for ordering supplies and building your own lighted clothing. We do offer consulting services for individuals and businesses who wish to develop prototypes and new products that are related to our areas of expertise.